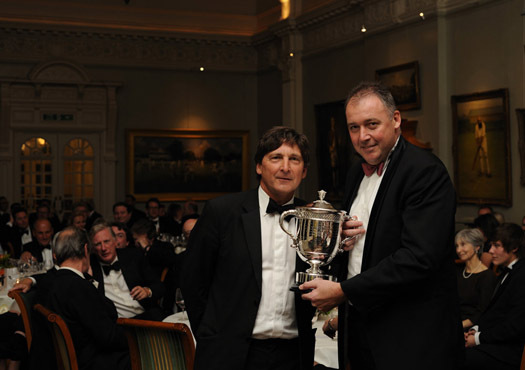 Angus Fraser, Middlesex’s Managing Director of Cricket, was on hand to receive the Walter Lawrence Trophy, on behalf of Adam Gilchrist, from the immediate past President of MCC, John Barclay at the traditional end-of-season dinner in The Long Room on October 18. Gilchrist, Middlesex’s star signing for last summer’s Twenty20 campaign, is the 2010 winner of the Trophy, awarded for the fastest hundred of the season. The 38-year-old Australian wicket-keeper/batsman thumped a blistering 47-ball century, which included 9 fours and 7 sixes, in the Friends Provident T20 victory over Kent, at Canterbury, on June 11.
on behalf of Adam Gilchrist, from John Barclay. In the 76th year of the Trophy, which is now open to all domestic international and county competitions, Gilchrist is only the third batsman to win the award for Middlesex : Mike Gatting in 1984 and Roland Butcher in 1987 being the previous recipients. Furthermore, following in the footsteps of Darren Lehmann (2000), Ian Harvey (2001), Damien Martyn (2003) and Marcus North in 2007, Gilchrist becomes the fifth Australian in 11 seasons to pick up the Trophy: he also received a cheque for £5,000. Also present at the dinner was Rory Burns of Cardiff MCCU, who is the 2010-season winner of the Walter Lawrence Trophy award for the highest-scoring batsman from the six MCC Universities. The 20-year-old left-handed opener and wicket-keeper hit a sizzling, unbeaten 230 against Oxford MCCU, in the MCC Universities Championship match at The Parks on April 27: the highest score in an innings played against one of the other five MCCUs or against one of the first-class counties this season. and a cheque for £1,000 from Mike Griffith. Epsom-born Burns, who was educated at City of London Freemen’s School, Ashtead, and has played for Surrey 2nd XI, hit 23 fours and 4 sixes in his innings, which was scored off 345 balls in the drawn game. Burns is the sixth recipient of the award since its inception, as well as the highest scorer, and is the second Cardiff player to win it. 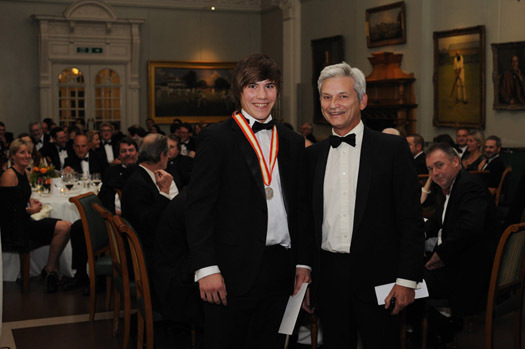 He received a silver medallion and prize of £1,000 from Mike Griffith, MCC’s Chairman of Cricket .